This page includes The WFSC Announcements columns from the 1999 issues of Across the Fence Post. To order by mail, send $1.50 each to: MaryAnn Bowman, P.O. Box 1451, Waukesha, WI 53187. Make checks payable to the WFSC and include a SASE. Trivia contest rules and questions will appear in the February issue of ATFF. Reserve a February or March club meeting date to join in on the fun! Win the new 2nd edition of "Adventures in Topical Stamp Collecting." If you want your show/bourse to appear on the list covering events through the summer of 1999, send details by no later than August 15, 1999, to: Karen Weigt, 4184 Rose Ct., Middleton, WI 53562-4339, (608) 836-1509, or e-mail karenweigt@compuserve.com. Include a contact name , address and phone number. The WFSC sincerely appreciates your support through donation of extra funds received with your 1999 dues payments. The flier will be updated and sent with the September issue of Across the Fence Post. If you want your show/bourse to appear on the list covering events through the summer of 2000, send details by no later than August 15, 1999, to: ATFP Editor Karen Weigt. An updated 1999 WFSC member-club mailing list is available for direct-mail club show/event publicity purposes. Request a copy from: WFSC Central Office and Secretary, Karen Weigt (address shown on this page, right column). Note: the list is for WFSC member-club use only. • Art Arntsen, of the Badger Stamp Club, for auditing the 1998 WFSC financial records. • Rollie Juhnke, who again served as our photographer for WISCOPEX and assistance at the WFSC society table. Paul T. Schroeder will serve as the next WFSC president. Schroeder is a member of the Oshkosh Philatelic Society and has held the position of WFSC East Central Region VP since 1997. Art Schmitz, member of the Wauwatosa Philatelic Society and the Polish American Stamp Club, will take over duties of Milwaukee Region VP. Schmitz is a WFSC certified judge. Vern Witt, WFSC past-president, judge, and member of the Wisconsin Philatelic Hall of Fame will fill the position of WFSC East Central Region VP. Witt is a member of the Sheboygan Stamp Club. The WFSC will again sponsor a nationwide cover exchange program in which all stamp clubs, philatelic organizations, and individuals may participate. This is an opportunity for clubs with leftover show, commemorative and first-day covers to reduce their inventory by exchanging them for different covers for use as club auction items, door prizes or gifts. • Barbara Mueller for a donation of stamps to the WFSC Youth Division. • Gene Wolosiewicz for donating two very special Billy Mitchell items with the First Day of Issue cancel. They will be offered as door prizes at WISCOPEX 2000. Ten years ago, the WFSC adopted a policy to produce a first-day cover for all U.S. Postal Service issues released in the state of Wisconsin. The policy includes an "if financially possible" exemption. Consequently, in spite of the recent flood of in-state first-day ceremonies, the WFSC currently has just two new FDCs to offer. The Billy Mitchell FDC was produced on July 30, when the stamp was issued in Milwaukee. 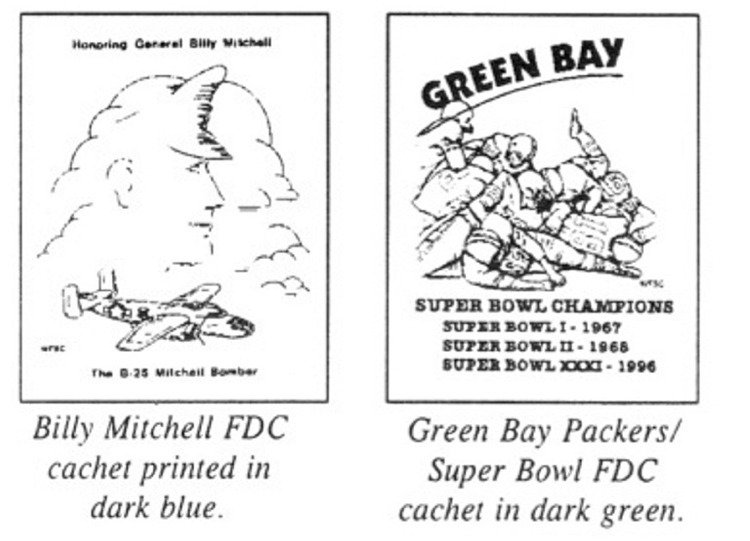 The WFSC's Green Bay Packers/Super Bowl FDC will be available as of September 17, when Green Bay will host the first-day ceremony for the 1960s Celebrate the Century issue. The Green Bay FDC will be franked with two of the 15 CTC stamps: Green Bay Packers and Super Bowl. WFSC VP Alan Marcus, of Neenah, WI, designed both cachets shown above. To mail order, send $2 each for the Billy Mitchell cover; $3 each for the Green Bay Packers/Super Bowl covers to: MaryAnn Bowman, P.O. Box 1451, Waukesha, WI 53187. Make checks payable to the WFSC and include a No. 10 SASE. Please be precise in indicating which cover(s) are wanted and the number of each wanted. The WFSC plans to produce a FDC for the Deer stamp issue, which will be released in Rudolph, WI, on October 20. Watch for details in the October ATFP. 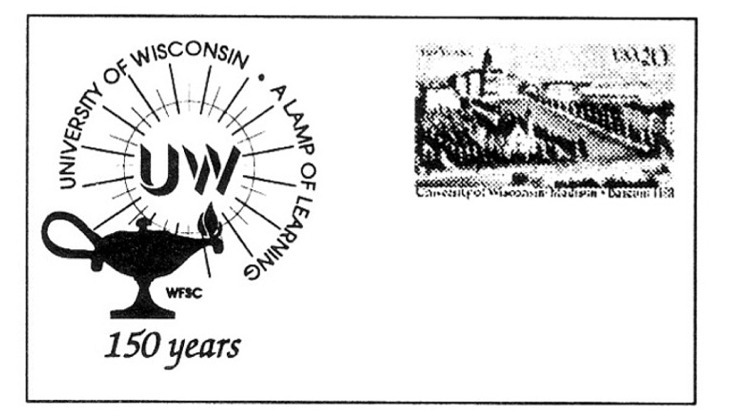 Nominations are still being accepted for the 2000 Wisconsin Philatelic Hall of Fame. The deadline is December 31, 1999. For details of qualifications and nominating procedures see the September 1999 issue of ATFP or request information from: Karen L. Weigt, Secy., WFSC, 4184 Rose Ct., Middleton, WI 53562. The WFSC has produced a first-day cover for the Deer stamp, which was issued at Rudolph, WI, on October 20. 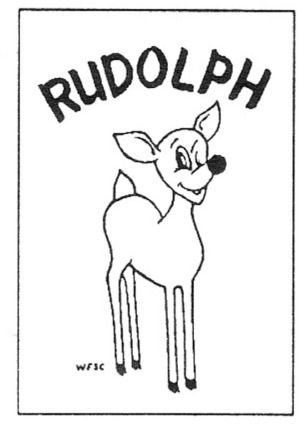 The cachet highlights Rudolph's red nose. Covers are franked with one 33cents Deer stamp. R. Bowman, P.O. Box 1451, Waukesha, WI 53187. Make checks payable to the WFSC and include a SASE.